Thanks. A sunny day always helps. . .and the scenery wasn’t bad either! What a wonderfully warm photograph of Heidelberg! I admit, I have never been there, but your photograph is so vibrant and inviting…I wish I could jump right in. Would you mind if I used it on my blog’s front page? Of course I would link the image back to your blog and give you full credit. Please let me know if you would rather I not. Thank you! Ooh so want to visit there one day! It’s a great city–lots to do, lots to see, and small enough to be very accessible. I hope you get to visit! It is beautiful, but the street is so narrow and the the houses so close together with not a patch of grass nor trunk of tree to be seen. I feel claustrophobic as well as awestruck. If you are used to wide open spaces, it is a different aesthetic. . .but charming in its own right. 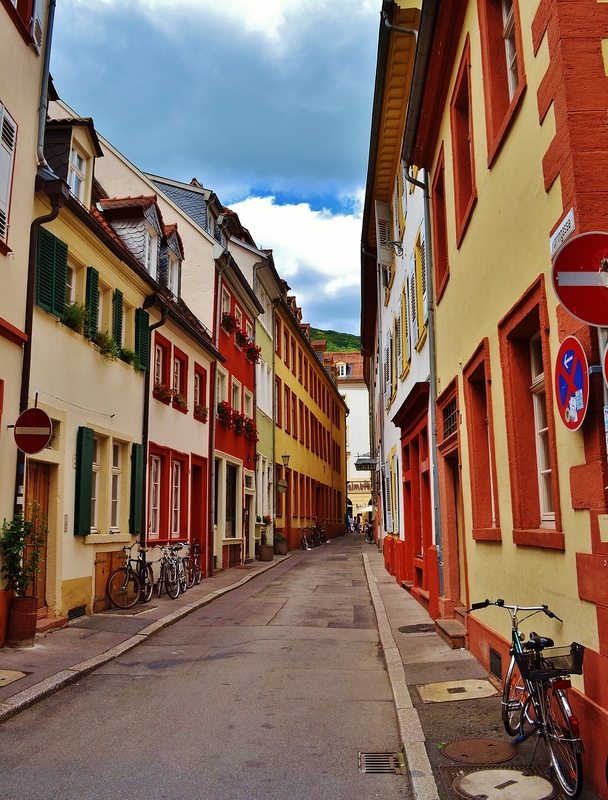 Beautiful photo 🙂 We visited Heidelberg nearly 4 years ago – we were staying in Koblenz and did a day trip from there by train. I remember the old streets and also the castle which was very interesting. It was also packed with tourists as it was Easter weekend! The castle, and the funicular ride up to it, are great–a fabulous sight to see floating over the city, and a wonderful view down onto the city. Heidelberg is lovely, and it has a special place in my heart, as my daughter was born there years ago.